Orchestra part from TOO MANY GIRLS. This is a good example of the changes made throughout the rehearsal process. Click here to see it larger. 2011 is going to be a banner year for our music department with no less than eight newly restored editions of classic Broadway musicals being made available for the very first time. 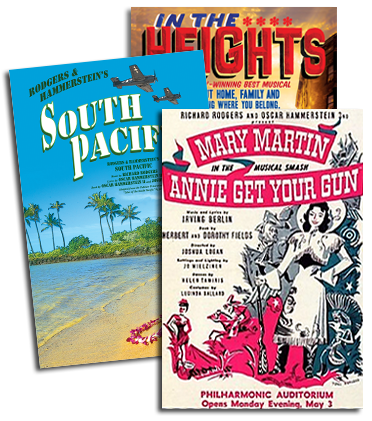 Rodgers & Hammerstein’s OKLAHOMA!, SOUTH PACIFIC and THE KING AND I; Andrew Lloyd Webber’s SUNSET BOULEVARD; Irving Berlin’s FACE THE MUSIC, Rodgers and Hart’s TOO MANY GIRLS and Jerome Kern and Oscar Hammerstein’s MUSIC IN THE AIR are now being readied for release in the coming year. And these will be quickly followed by Rodgers & Hammerstein’s PIPE DREAM, a 1955 musical that has not been available in any form for the last two decades. What is a restoration? (You may well ask!) And why is a new edition of a show, especially one that has been in the popular repertoire for decades, even necessary? To answer these questions you will first need to examine the process of creating a musical on Broadway. It always has been and continues to be a chaotic undertaking, one in which composers, lyricists, librettists, vocal arrangers, dance arrangers, orchestrators, directors, choreographers, actors and musicians are working as fast as they can to meet the deadline of an opening night. You might think that the great Broadway musicals were born in a calm and deliberate atmosphere, great works of art that rather like Venus stepped out of the half shell onto a solid footing of dry land, but this is not the case. As the deadline of the New York opening closes in, a musical can be written and rewritten, staged and restaged, ripped apart and stitched back together over and over again as the members of the creative team work towards making a show as perfect as possible. Songs are added and cut, keys are raised and lowered, orchestrations are written and changed – all of this taking place in the pressure cooker of the rehearsal period and even into the previews. While all of this is going on the stage manager is writing the dialogue, lyric and staging changes as fast as he can into the script from which he will be calling the cues for the show. At the same time the musicians in the orchestra pit are taking notes from the conductor and altering the musical parts in front of them to conform to the latest requests from the composer, the orchestrator, the choreographer, the sound department and anyone else who has an input into what the audience will be hearing. A lyric may not be coming through over the trumpets, so the brass section is asked to not play certain measures. Dialogue may be overpowered by the underscoring so the violins are asked to play a particular phrase an octave lower (and therefore more quietly) than written. Sometimes the musicians will write these fixes very carefully into the parts. However, often as not, they will simply commit the fixes to memory and do nothing more than put an X or a check or an exclamation point over the measures of music requiring alterations. In the haste of the moment the conductor might turn to his left and tell the oboist not to play (or to “tacet”) a certain passage of music, and several other players in the vicinity of the oboist mistakenly thinks the conductor is talking to them and cross out the same passage. The next night the conductor realizes what has happened and instructs the mistaken players to restore the missing passage. Some of them may make a note on the page, and others may simply commit to memory that the passage is to be performed. 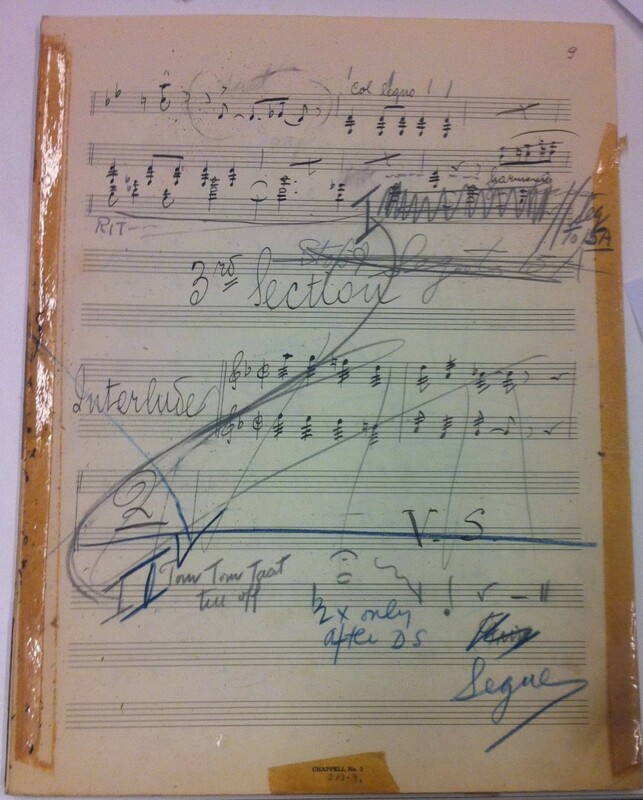 Thirty years later a copyist without access to a full score, or to the conductor or to any of the original players, copies what he sees on the page. And at that point a particular piece of orchestration may be lost forever. Well, not quite forever. But the question of how to determine what was actually meant to be played and what was simply mismarked is only the tip of the restoration iceberg. Next, we’ll take a look at some specific examples of how the great composers and arrangers and orchestrators and conductors worked, and how tracking their processes can lead to clues that help solve mysteries that are decades old. Will any of these restored editions be published in full vocal score format? Also, will there be any restored edition of Cats? I hope I can have the chance to look at the full score for the Broadway version of the score.